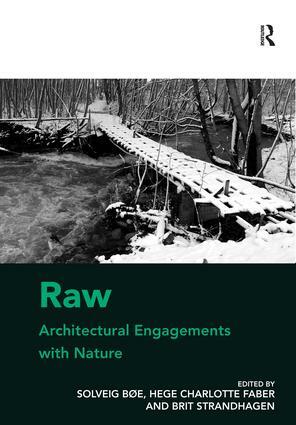 Through cross-disciplinary explorations of and engagements with nature as a forming part of architecture, this volume sheds light on the concepts of both nature and architecture. Nature is examined in a raw intermediary state, where it is noticeable as nature, despite, but at the same time through, man’s effort at creating form. This is done by approaching nature from the perspective of architecture, understood, not only as concrete buildings, but as a fundamental human way both of being in, and relating to, the world. Man finds and forms places where life may take place. Consequently, architecture may be understood as ranging from the simple mark on the ground and primitive enclosure, to the contemporary megalopolis. Nature inheres in many aesthetic forms of expression. In architecture, however, nature emerges with a particular power and clarity, which makes architecture a raw kind of art. Even though other forms of art, as well as aesthetic phenomena outside the arts, are addressed, the analogy to architecture will be evident and important. Thus, by using the concept of ’raw’ as a focal point, this book provides new approaches to architecture in a broad sense, as well as other aesthetic and artistic practices, and will be of interest to readers from different fields of the arts and humanities, spanning from philosophy and theology to history of art, architecture and music. Solveig BÃ¸e is associate professor of philosophy at the Department of Philosophy and Religious Studies, NTNU - Norwegian University of Science and Technology. Her research interests include metaphysics, philosophy of nature, aesthetics and art. She has published a number of articles, mainly within history of philosophy and metaphysics, and participates regularly on a national radio program on jazz and philosophy. Hege Charlotte Faber is senior research librarian at NTNU University Library, NTNU - Norwegian University of Science and Technology. Her research interests include aesthetics, contemporary art and history of art. She is currently working on a monograph about the Norwegian artist Jon Arne Mogstad. Brit Strandhagen is associate professor of philosophy at the Department of Philosophy and Religious Studies, NTNU - Norwegian University of Science and Technology. Her research interests include aesthetics and philosophy of art, aesthetics and ethics, environmental aesthetics and history of philosophy. She has published on Kant’s aesthetics and also on other topics, mainly within aesthetics.